Automotive supplier Visteon Corp.'s third-quarter loss widened on reorganization and post-retirement related expenses, although sales rose slightly. Visteon on Tuesday said it posted a loss of $140 million compared with a year-earlier loss of $38 million. The latest results include reorganization and other post-retirement employee benefit plan costs that totaled $169 million. Net sales climbed 1.6 percent to $1.7 billion, Visteon said. 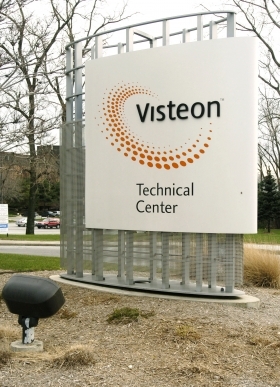 Visteon said product sales during the third quarter increased by $26 million year-over-year, or approximately 2 percent. The increase in sales reflected slightly higher production volumes tempered by currency movements and the impact of previously completed plant divestitures and closures. On Sept. 1, Visteon ended leasing agreements with Automotive Components Holdings LLC. The termination of services provided under the arrangements also resulted in the transfer of about 2,100 employees to Automotive Components Holdings, a Ford Motor Co. unit. Asia accounted for 42 percent of Visteon's product sales, up from 36 percent a year earlier. Europe represented 34 percent of sales, followed by North America with 17 percent, and South America at 7 percent of sales. Hyundai and Kia accounted for about 30 percent of Visteon's third-quarter product sales, with Ford generating 25 percent, Renault-Nissan 8 percent and PSA Peugeot-Citroen 6 percent. During the latest quarter, gross margin slumped to 2.4 percent from 7.2 percent, reflecting bankruptcy costs, the company said. A sharp drop in automotive demand during the depths of the recession forced Visteon to file for Chapter 11 bankruptcy protection in May 2009. It emerged from bankruptcy earlier this month under a restructuring plan that cut its debt by more than $2 billion.